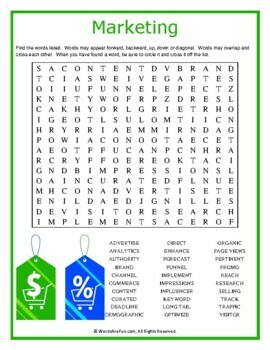 A word search puzzle featuring words associated with marketing. 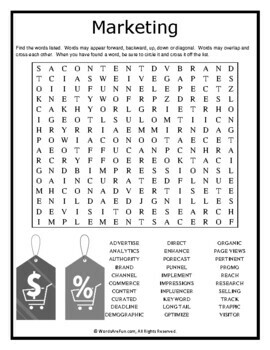 This word search will help instill the basics of marketing. Use this sheet as part of your teaching curriculum, a treat for early finishers or just for fun. Word List: Advertise, Analytics, Authority, Brand, Channel, Commerce, Content, Curated, Deadline, Demographic, Direct, Enhance, Forecast, Funnel, Implement, Impressions, Influencer, Keyword, Long Tail, Optimize, Organic, Page Views, Pertinent, Promo, Reach, Research, Selling, Track, Traffic, Visitor.